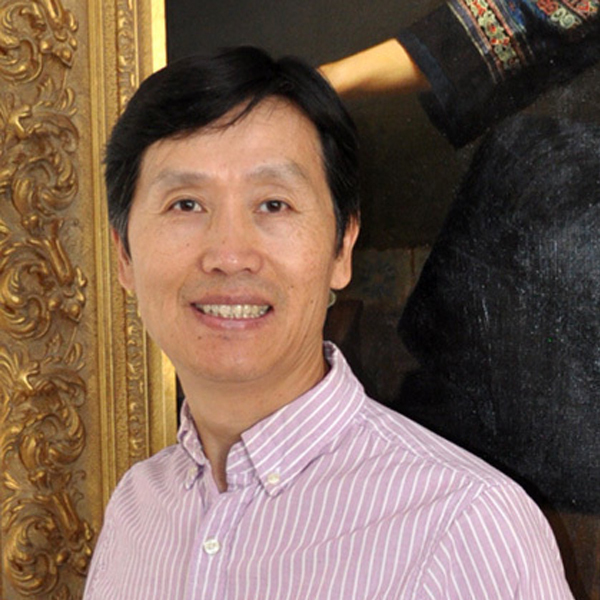 Jie Wei Zhou is a master realist whose love and talent for art brought him from Shanghai, China to the United States. Jie Wei Zhou developed an early passion for art in middle school, where his teachers soon recognized his gift. He continued his artistic pursuits with increasing dedication and went on to earn a Bachelor of Arts Degree from Shanghai Normal University. During this time, he extensively studied both French and Russian painting styles and refined his mastery of light and form. Then, in 1991, he became one of only eleven chosen students in his city of thirteen million to earn a Masters in Fine Art from the prestigious Shanghai Drama Institute. Jie Wei Zhou became a renowned artist in China and then achieved his dream of painting in America by sending his rolled canvases to a gallery in the U.S. The gallery sold his artwork and deposited the money in a savings account to pay for his passage. Now a U.S. Resident residing in Colorado, Jie Wei Zhou continues to remember and honor his cultural roots through his Chinese subject matters. Primarily an oil painter, Jie Wei Zhou creates with a distinct voice and refreshing originality. He conveys a story or invokes a certain emotion in each of his works because he believes that art is one of the purest forms of communication. Through sharing these narratives and memories he hopes to increase the understanding and appreciation for Asian cultures and remind viewers of their own similar experiences. As such, painting is a very personal journey for him and those who view his artwork often feel as if they are ‘in the moment’ with the subjects and offered a unique glimpse into the story of another individual’s life.